A tooth that has become badly infected often needs to be removed to prevent the infection from spreading. A tooth extraction is considered the most invasive of all dental procedures since it does completely remove the tooth. However, dental implants are one of the top dental procedures to consider for a missing tooth. 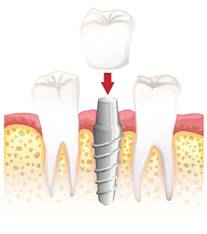 Dental implants are considered a replacement tooth for a missing tooth. Using a titanium screw, it is surgically positioned into the jawbone. The jaw bone will fuse with the titanium, becoming strong enough to support a tooth. Once the jawbone has fused with the titanium, a dentist will be able to create a false tooth that is attached to an abutment on the titanium implant. Dental implants look and feel like traditional teeth as they are anchored within the bone and will not become loose like dentures and implants can. Dental implants are considered an excellent replacement option for a missing tooth. Are you a candidate for implants? Implants are fused to the jawbone, so they function just like the rest of your teeth. Based on your oral health condition, a dental implant could be stronger than your natural teeth. Natural teeth are still prone to shifting within the mouth where an implant is solid and will remain in position. Dental implants function like a traditional tooth, which means you do not need to worry about sore sports, gagging, and poor ridges caused by dentures. Even dental bridges can cause problems and could eventually fail if infection occurs within one of the anchor teeth. Endosteal implants – these are surgically inserted into the jawbone. An endosteal implant normally uses titanium screws placed within the jawbone, but there are other materials available for patients with health conditions that could cause the body to reject titanium. Once the area has healed, a second surgery is performed to connect the post to the implant. Finally, an artificial tooth will be created and attached to the dental implant. Subperiosteal implants – these implants are different as they are used to replace multiple teeth. A metal frame is created and is fitted to the jawbone, just below the gum tissue. Once the gums heal, the frame will become fixed to the jawbone and the posts are then attached to the metal frame. Artificial teeth are created and attached to the endosteal implant which is secured to the metal frame. To receive dental implants, you will need to schedule a consultation with our office. We will need to take x-rays and determine if the jawbone is strong enough to support an implant. Your overall oral health will be taken into consideration as we look for problems that may cause an implant to fail. Failure to have enough jawbone density may require patients to receive bone grafting to build up the jawbone and make it strong enough. As long as the bone grafting is successful and the gums are healthy, patients are normally cleared for dental implant surgery. For a dental implant to last, it is essential to maintain oral health and visit the dentist regularly for examinations and cleanings. We need to check on the dental implant yearly to ensure it is remaining strong within the jawbone. When a tooth is removed from the jawbone, the bone can start to disintegrate. Failure to have a tooth in the area is telling the body it no longer needs to send nutrients to this area, which keep it healthy and strong. The jawbone begins to shrink, and can impact your appearance by giving your face a “sunken in” look. Not only does that jawbone have issues, people often find it is difficult to eat and speak when they are missing a tooth. The area can lead to shifting of other teeth, causing your teeth to become crooked. A dental implant only requires work in one area of the mouth compared to dental bridges which can often disrupt two other teeth to maintain a false tooth in the area. Dental bridges will continue to have a problem with the jawbone dissolving as it does not do anything to improve the jawbone. Dental implants are not only considered a smart decision for missing teeth replacement, they boast a 98% success rate. If you would like to learn more about dental implants in Long Island, give our office a call today!